Say Goodbye DIY Blog Cabin, Hello DIY Ultimate Retreat! If you've been eagerly awaiting the annual DIY Blog Cabin Giveaway, here's some good news and bad news for you. The bad news is that the DIY Network is no longer offering the Blog Cabin Giveaway. The good news is that DIY is offering an even more exciting giveaway in 2017: The Ultimate Retreat ​Giveaway . 2016 was the ten-year anniversary of the Blog Cabin Giveaway, and fans did not suspect that it would be the last. The Blog Cabin started out as a more affordable home giveaway than the Dream Home Giveaway that allowed the public to take a hand in its design. Each year, the DIY Network would select a cabin or other small house and, with the public's input, transform it into a beautiful place to live. During the weeks leading up to the giveaway, viewers would have the opportunity to vote on design details and decor choices in the various rooms of the home. The final result would be shown during the DIY Blog Cabin on-air special and the home would be given away to one lucky winner. Over the years, the Blog Cabins started becoming more extravagant. The 2016 Blog Cabin winner's home was worth over $960,000, compared to the modest $330,000 price tag of the 2007 prize. After ten years of Blog Cabin sweepstakes, Scripps Networks Interactive took a look at whether their big giveaway was striking the right notes with their viewers. Scripps Networks' Media Relations Specialist Matt Kothe said that viewers were craving a slightly different angle: less sitting back and watching what the specialists would design, more design tips that they could put into practice in their own homes. "It has become increasingly popular for home buyers, many of whom are fans of our programming, to undertake home renovations themselves," Matt Kothe said. "The DIY Network Ultimate Retreat gives us a chance to capitalize on this affinity for do-it-yourself projects by showing the complete, room by room transformation of an existing home in a way that resonates with our viewers and inspires them to do some renovation work of their own." In order to help viewers find projects that they can do themselves, the DIY Network "extensively documents" the renovation from start to finish, according to Matt Kothe, then presents the results in a television series so that viewers can follow along throughout the process. The on-air episodes demonstrate renovation projects that homeowners can tackle to make their home more liveable and to raise their property values. Meanwhile, the Ultimate Retreat How-To Projects section of their website provides step-by-step directions, material lists, and estimated costs for projects that appeared in the series. How-to videos make it easy to see how to undertake the project at home. Some of the projects from the first Ultimate Retreat giveaway in 2017 include a handsome grilling station, an upcycled bathroom vanity, and a striking planked headboard wall. Each project is easy enough for a semi-skilled DIYer to complete on their own. "We know from over 20 years of doing home giveaways that people love the thought of owning a home in a fabulous getaway spot. DIY Network's Ultimate Retreat is all about incredible vacation destinations." 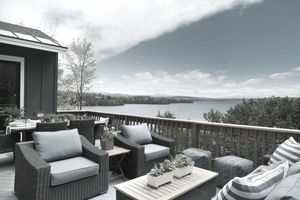 To kick off their rebranded giveaway, the DIY Network's design team chose a cozy wooded location on the shores of Lake Champlain in Burlington, Vermont, which Matt Kothe describes as "absolutely one of the most breathtaking settings you’ll find in the United States." The DIY Network aims to find beautiful locations like this for their Ultimate Retreat giveaways, year after year. "We want the Ultimate Retreat to capture that feeling every year by showcasing similar locations across the country, and we think fans will be more excited than ever to enter the giveaway," Matt Kothe said. We already know that finding the perfect location will be an important element of the Ultimate Retreat Giveaway in years to come, but you can't spend all your time in the great outdoors. The interior of each Ultimate Retreat needs to be knock-your-socks-off stunning as well. When its location is a major feature of your home, you want to be sure to take advantage of it, and the DIY Network's homes make a point of doing just that. The 2017 Ultimate Retreat has plenty of natural light thanks to giant windows and sliding glass doors that show off views of the lake. Even the shower looks out over the water. The living room has a glass wall that can be folded away when the weather is nice, with a screen that pulls across the opening, to help the winner enjoy the natural surroundings even more. As with many of the homes that Scripps Networks has given away recently, the main living areas of the 2017 Ultimate Retreat have an open layout. There is a natural flow between the dining room, kitchen, and living room, although each room has its own design elements to set it apart from the others. This is a trend that has been popular year after year, and it's likely we'll see it again in the future. What's the point of a gorgeous house if you can't share it with your nearest and dearest? The 2017 Ultimate Retreat has lots of room for overnight guests including a guest bedroom, a sleeping nook, and a family den with a sleeper sofa. Of course, it also features a private master bedroom and bath, where you can retreat if you need some quiet time on your own. If you are going to have all of these overnight guests in your retreat, you'll want to be able to cook for them in comfort as well. The 2017 Ultimate Retreat farm-style kitchen has a big island for dining or preparing food, plenty of counter space, and high-end appliances to make cooking a pleasure. The dining room also has nice features for entertaining including a coffee bar, plenty of storage, and a beverage refrigerator to help your guests feel right at home. Home giveaways from Scripps Networks have emphasized sustainable designs with minimal impact on the environment. The 2017 Ultimate Retreat continues this commitment with an upcycled vanity in the master bathroom, a dining room table made from the home's original flooring, decor sourced from local craftsmen, and more. In fact, DIY Network Ultimate Retreat 2017 Designer Elizabeth Demos said that "merging the products and resources provided by talented craftspeople, artisans and sponsors to create a beautiful home for one lucky winner" was the most exciting part about working on this project. The 2017 Ultimate Retreat website has lots more photos and videos that you can watch to see which trends you hope will continue in future home giveaways from Scripps Networks. Don't be disappointed that the Blog Cabin giveaway has been retired. The DIY Network and Scripps Networks have created an annual giveaway that's even more exciting and paired it with tips and inspiration that could leave you with an even more beautiful home. Why Doesn't HGTV Give Away an Affordable Dream Home?